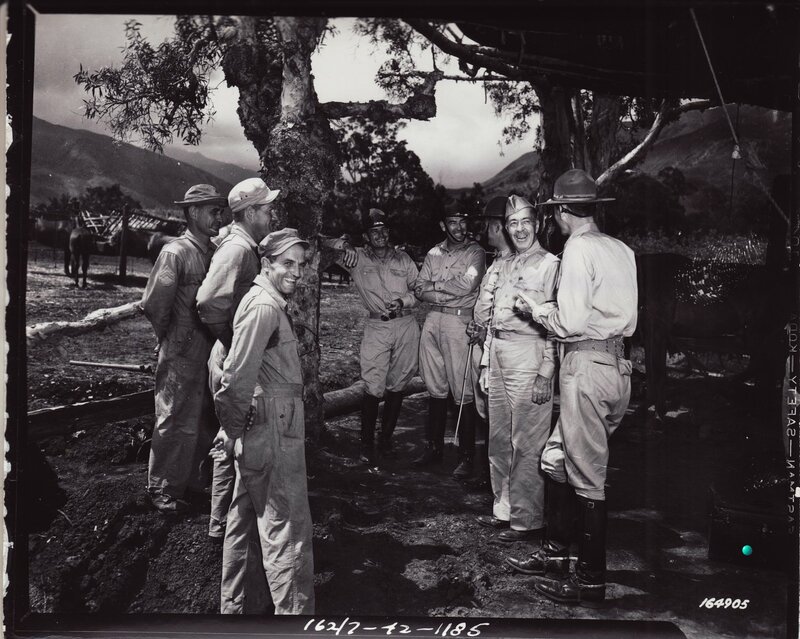 from the National Archives in Washington, DC. .
Not for duplication without permission ~ ERB, Inc.
Mr. Edgar Rice Burroughs talks with enlisted men and officers as he recalls his experiences with the 7th Cavalry before World War I.
Mr. Edgar Rice Burroughs, author of Tarzan, watches horse-shoer. 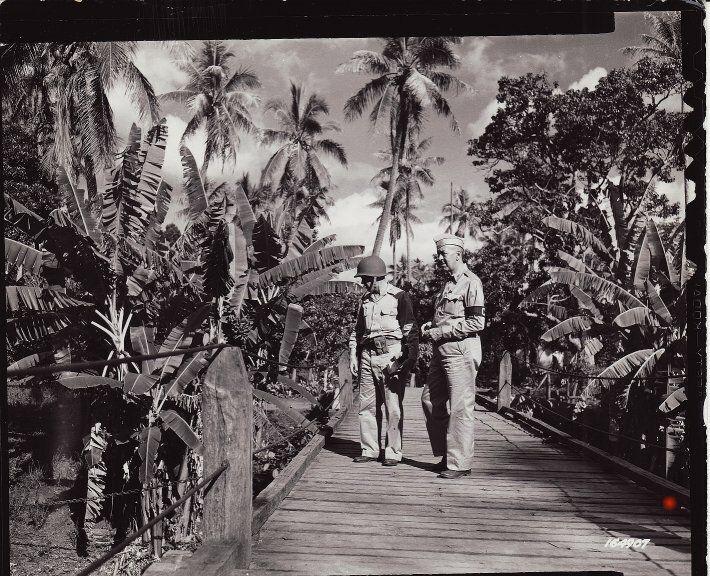 Edgar Rice Burroughs, author of Tarzan, visits his first former cannibal village during his stay in New Caledonia while covering the war zone in the Pacific as a War Correspondent. 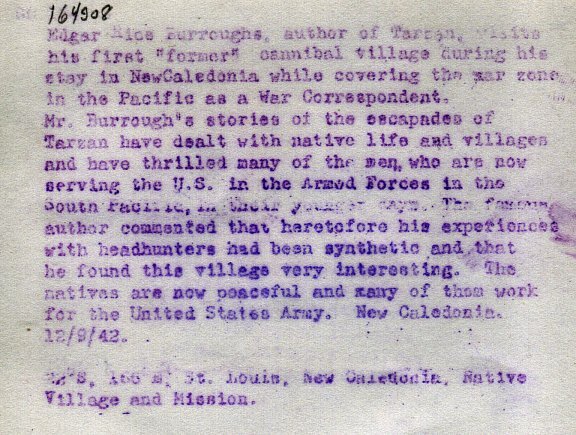 Mr. Burroughs' stories of the escapades of Tarzan have dealt with native life and villages and have thrilled many of the men, who are now seriving their country in the Armed Forces in the Pacific, during their younger days. 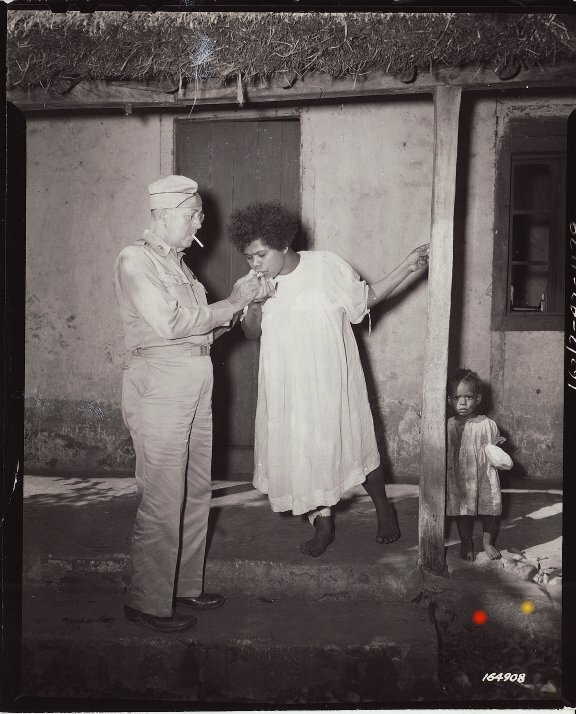 The famous author commented that heretofore his experiences with headhunders had been synthetic and that he found this village "very interesting." The natives are now peaceful and many of them work for the U.S. Army. 22o S, 166o E., 162nd Signal Photo Det. St. Louis, New Caledonia, Native village and mission. 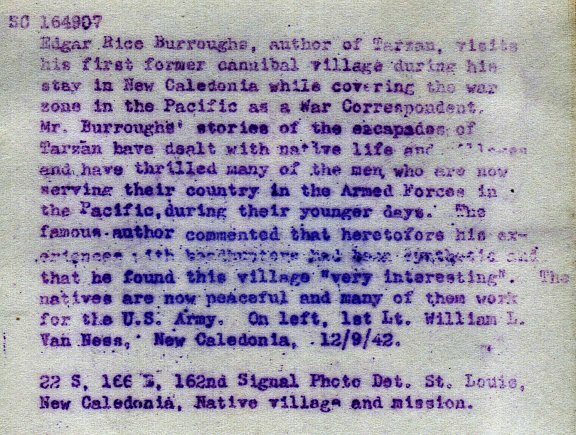 Edgar Rice Burroughs, author of Tarzan, visits his first "former" cannibal village during his stay in New Caledonia while covering the war zone in the Pacific as a War Correspondent. Mr. Burrough's (sic) stories of the escapades of Tarzan have dealt with native life and villages and have thrilled many of the men, who are now serving the U.S. in the Armed Forces in the South Pacific, in their younger days. The famous author commented that heretofore his experiences with headhunters had been synthetic and that he found this village very interesting. 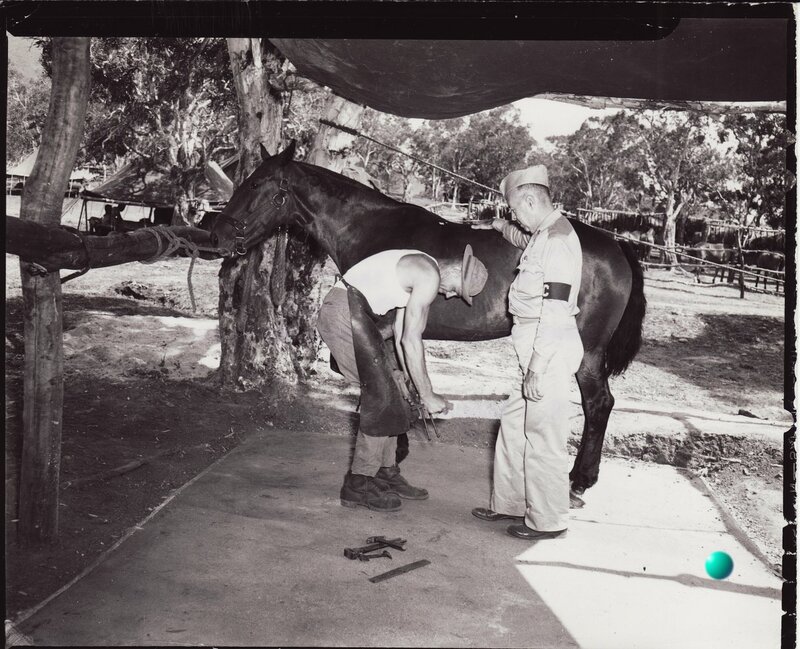 The natives are now peaceful and many of the work for the United States Army. St. Louis, New Caledonia. 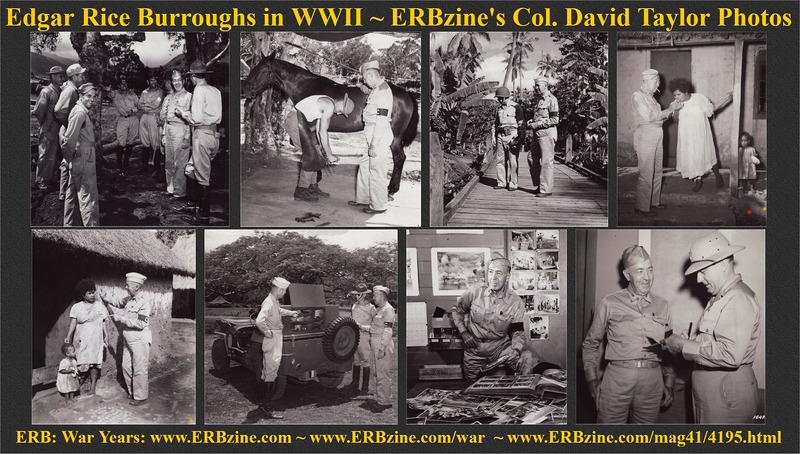 MEET COLONEL DAVID TAYLOR These are photos of Edgar Rice Burroughs as a WWII War correspondent in the Pacific Theatre. I am the WWII historian (although I am a Vietnam War combat vet) for the Americal (23rd) Army Division Veterans Association (ADVA). I have spoken to many WWII vets in our association and ERB was quite popular with the troops because they all grew up on his Tarzan books. I served with the Americal as an infantry officer in Vietnam in 1969, was wounded twice, served four years on active duty and 22 years in the Army Reserve Special Forces ("Green Beret") branch. As a child in the 50s I read the Tarzan books voraciously, I loved Burroughs' writing style; his books seemed to tell two stories until the end when he brought them together. Each chapter he would take the reader to a high point of suspense on one plot, and then switch to the other plot, leaving you anxious to read the next chapter to get through the next plot so you could find out what happened to the first. But then, of course, you were left anxious about the second plot as well. I also collected Tarzan comic books (as many as I could find… the lady at the comic book stand in a discount mall near our home would save them for me). I also obtained Tarzan movie posters, including several Johnny Weissmuller posters and got a signed autograph from Gordon Scott, the Tarzan of the 50s. It's a shame he died before his time and virtually penniless as I understand. As a child my goal was to be a movie Tarzan; we had lots of woods around us in Southern New Jersey where I grew up and, like Don Bragg, the pole vault champ, I built a tree house and swung on vines and ropes in the woods, giving the Tarzan yell. At about 12 I realized I would never grow to be 6'3" so I turned my attention to the Army Infantry. 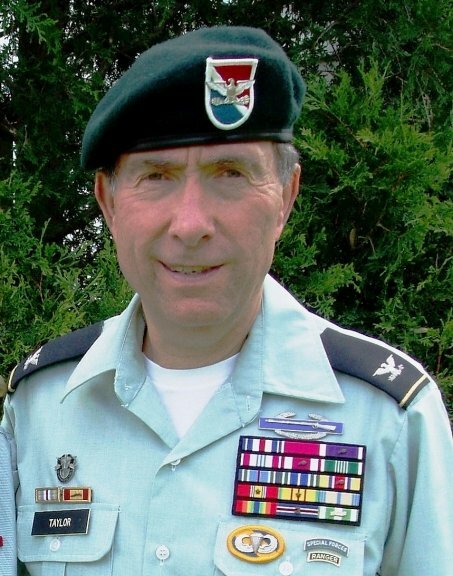 I entered the Army in 1967, became an infantry officer, served in Vietnam and a total of 26 years on active duty and in the reserves, became airborne, ranger, special forces qualified, retiring in 1993 as a Colonel. Speaking about Don Bragg, he lived in Pennsgrove, NJ about 45 minutes from me, apparently having the same childhood -- swinging from ropes in the woods. Unlike me he grew to be 6 feet 3 inches tall and, of course had a magnificent career as a pole vault Olympic champion. It is very unfortunate he never got his wish to be a movie Tarzan. I think he would have been excellent. I think the town of Tarzana has missed out on a good opportunity by not having a Tarzan Museum in their town. My civilian background was marketing, serving as senior manager of advertising and public affairs for a $1.2 Billion plastics company. I hope some smart people in Tarzana will one day reconsider the Tarzan museum. I am sure there are many people like me around the country who could help make it successful. But, for now, I will continue to relish my childhood in the 50s when Edgar Rice Burrough’s brainchild – Tarzan of the Apes - helped make my childhood so special.